It's rare that the Japanese admit failure at something, but when they do they often make the admission in ways that simply don't resonate right with Western audiences. This just seems odd to me in every way. We have a section on their Web site for products that basically says "no such products will be available." I don't think that's what Nikon intended. 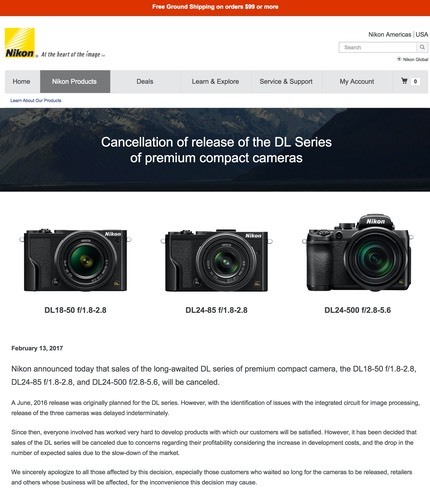 Having long had to read between the lines with Nikon's wording due to the translation component, the "cancellation...of the DL series of premium compact cameras" (my emphasis) I think is supposed to be interpreted as "we'll have premium compact cameras, just not the ones we announced in early 2016." Yet the takeaway from everyone who comes to that page will be that Nikon has no premium compacts and won't. But there's more. Nikon makes the admission on that page that their engineering had issues, which caused an initial delay, and then corporate decided that these products wouldn't be profitable enough once fixed. For the Japanese, this is the equivalent of airing dirty laundry in the front yard and inviting everyone over to look at it. To what end? As long as this page sits in the Nikon product listings, it's just an open statement of embarrassment that will probably produce incorrect inferences (again, that Nikon won't make any premium compact cameras). The cancellation should be left as a news story in the Press Room, not a long-term marketing statement in the Products section. While I appreciate the apology within Nikon's statement, given that there is no statement of how they're going to deal with this product segment in the future, having this page so prominent in their product section is just going to send people to competitors. The on-going takeaway is simple: Nikon is not capable of producing such products (premium compacts). Note: the Japanese site is a little better. When you get to the Premium Compact page, you just get a simple statement that the series was cancelled on February 13th (though if you click through on the individual products, you'll get the full apology statement). The irony here is that Nikon is trying to be open and communicate with its customers, something I've called for many, many times in the past. Yet in doing so here, they've actually got much of their customer base wondering what the heck is going on in Tokyo that this product launch could have gotten so completely messed up. The missing component is the usual missing one in an apology: what actions are you going to undertake to make sure this doesn't happen again? Nikon mentions "inconvenience," but that's an open-ended inconvenience for anyone thinking that they might buy a Nikon premium compact camera in the future. Nikon gives us no forward-looking statement as to what they're going to do about this market segment, not even a throw-away line like "we're working on coming up with better solutions in this product category." Frankly, if the DL products were ready and performed as expected, Nikon should have just released them. Or maybe only a subset of them. The damage that Nikon is now doing to their reputation is ongoing, considerable, and won't be repaired until such time as Nikon has a premium compact product on the market that is competitive. 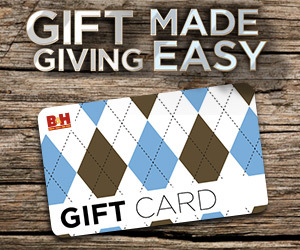 There are times when you sometimes have to produce a product that has a lower return on investment than you'd like, mostly because it shores up a hole in your business and confirms your brand reputation while establishing a placeholder in the category. The DL line should have been just that. Given the last minute decision to cancel DL, I highly doubt that Nikon has anything in the pipeline that will soon make us forget these now non-existent models. But their competitors do. With KeyMission in retreat, Coolpix gone cold, Nikon 1 in a state of suspended animation, the lack of DL models now makes Nikon "only a DSLR company." As good as Nikon's DSLRs are, they're not good enough to insure long-term viability. Nikon is in danger of going rapidly from a broad line camera company to a niche DSLR company and all that implies.